Where should I start? Well I am going to go right back to basics for solid fuel and keep things simple. Forgive me if you are ahead if the curve on this. NOTE THAT I ALWAYS INCLUDE A VENT ON MY STOVE CIRCUIT DIAGRAMS EVEN IF IT ADDS DETAIL NOT REQUIRED FOR THE POINT I AM TRYING TO MAKE. THIS IS A CRITICAL SAFETY FEATURE AND ALLOWS THE SYSTEM TO LOSE STEAM (PRESSURE) SHOULD IT BOIL. ON ANY SOLID FUEL CIRCUIT THERE SHOULD BE A ROUTE TO VENT THAT HAS NO RESTRICTIONS OR POSSIBLE RESTRICTIONS (NO PUMPS/TAPS/VALVES NO ANYTHING). JUST PIPE (MIMIMUM 22MM DIAMETER FOR VENTING PURPOSES). NO FUNCTIONING VENT MEANS YOUR STOVE WILL EXPLODE LIKE A BOMB. There are a few stoves that can be fitted to unvented circuits. This is a very specialised area and outside the scope of this website. It is important to realise that all of the pipes are full of cold water almost to the top of the vent pipe (circuits fill from loft header tanks and will circuits will fill to same level as header tank). All solid fuel stove circuits centre around one basic principle: hot water rises through cold water (hence why when you swim in the Med the water gets colder if you dive down a few metres). In the scribble above the stove has been lit and the water within the stove (in a metal box within the stove or in the jacket of the stove) heats up. 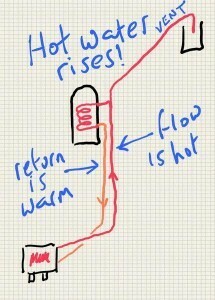 The heated water rises to the top of the stove and starts to rise up the pipe that is connected to the top of the stove (the red pipe in our scribble). Because warm water is leaving the stove, cooler water from the orange pipe flows into the stove to replace what has left. As things heat up so the speed of this process increases and we end up with a circuit of fast flowing water: up the red copper pipe, through the copper coil and down the orange copper pipe. This is what is often called “gravity circulation”. Note that no pump is required! The benefit of course is that the water in the cylinder itself is gradually heated by the hot coil (the cylinder is known as an “indirect cylinder”). Note that the water in our primary circuit never mixes with the main mass of water in the cylinder (primary circuit water has a chemical known as “inhibitor” added to it to prevent rust). It should now be obvious that the diameter of the pipe for the gravity circuit is important. If the water rising up the red pipe cannot get away from the stove fast enough then it will stay in the stove longer and might boil (not good). Hence the primary circuit pipework will increase in diameter as the stove power increases. For stoves under 35kw 28mm diameter is recommended. Note that the cylinder in the above picture can be replaced by a radiator should domestic hot water not be required (this detailed further down). The stove does not boil because the hot water rises up the red pipe and is cooled whilst it travels DOWN through the coil (because the water in the cylinder itself is cold and therefore cools the coil). Hence the red pipe (we call this the FLOW) is hotter than the orange pipe (we call this the RETURN). Note that the flow pipe is always connected to the top of the cylinder coil (from the top of the stove). The cylinder is acting as a HEAT SINK (a term we will come across again), in other words it is stealing heat from the primary circuit. This means that the red pipe (FLOW) is hotter than the orange pipe (RETURN) and as long as this continues the circuit will flow. Of course the cylinder water will gradually increase in temperature and will, at some stage, not cool the coil – then then gravity circuit will slow and will eventually stop (leading eventually to everything boiling). We will come back to this scenario. If a boiler stove has two pipes then the primary circuit attaches to those two pipes (flow to higher pipe). If a boiler stove has four pipes then the primary circuit will attach to two of the four, corner to corner. Imagine the four dots on dice: the flow attaches to either of the top two pipes whilst the return attaches to the opposite corner on the bottom of the stove (in this case the other two are for the radiator circuit or can be capped). You should have at least two metres of height between the centre of your boiler and the centre of your coil (some people suggest one metre is sufficient) for the gravity flow to take place effectively. Gravity flow is assisted by vertical separation between heat source (stove) and a heat sink (in this case the cylinder). This is why cylinders and airing cupboards are upstairs, often directly above fireplaces. Gravity flow is also assisted by fat pipes (check with stove manufacturer but 28mm diameter is the norm) and shallow bends (e.g. a bend created with a pipe bender is better than a 90 degree elbow and two 45 degree fittings next to each other are better than one 90 degree fitting so if no bender available do what I do and make all your corners from two 45’s!). You might think “well I’ll just pump it”. This is not acceptable. If you have a power cut or the pump fails then the water will boil. If your cylinder is on the same floor as your stove there are other circuit designs that will work (we will come back to this). Everything I have described so far is what is called THE PRIMARY CIRCUIT. The primary circuit operates without a pump and has a heat sink at the top of its circuit. The primary circuit is at the centre of any solid fuel stove circuit. In any power cut or equipment failure this circuit is always in place and will always prevent the circuit boiling (unless you really rev up the stove to overpower the heat sink). Our aim is to create a system that will not boil – even in a power cut. If all else fails and it does boil – it will be safe. 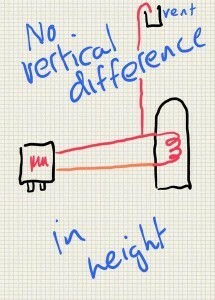 Obviously it is not always possible to go vertical without having some horizontal*. 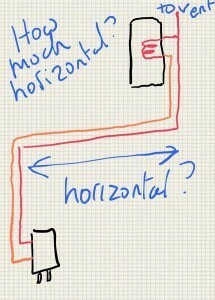 But how far horizontally can you go? And how long can your pipes be? To be honest I have never quite discovered the limits (maybe I am rather conservative). I have seen many systems work that I would have expected not to work. As a rough guide I would travel at forty five degrees rather than horizontally if at all possible (often not possible of course because of aesthetics but remember you can always box pipes or add a thin false wall). Distance of pipework (length of pipework)? If the stove is within 10m of the heat sink then don’t worry about it. I am not sure how far one can push this. I have though seen a working system with the heat sink at least 20m away (10m of gradual horizontal rise combined with 10m vertical). *Note: Horizontal should never actually be horizontal. All pipework between stove and heat sink on both flow and return should have a slight rise (the more the better but any rise is acceptable). This is to allow any trapped air to rise up to the vent and escape. Even off the back of the stove pipework should have a slight rise. GOLDEN RULE: NEVER HAVE A DIP IN PIPEWORK – no section of pipe should be horizontal or point downhill as air will trap here. Have as few bends as possible. If possible use a bender. If not use two 45’s rather than one 90.